nce Upon a Time: The Complete First Season Is A magical fun series that even teens will enjoy! One of the best series this year in my estimation Once Upon a Time: the Complete First Season has been released on Blu-ray in a box set. This fairytale has all the frills of a theatrical release including some nice special effects, commendable acting and a very good storyline. Intriguing, creative and exciting after the first few episodes it's addictive as reading a good book, putting it down becomes very hard to do. But, you will want to take breaks between several of the twenty-two episodes so you can do other things like eat, sleep and give the TV a rest. The series stars Josh Dallas as Prince Charming (and David Nolan), Lana Parrilla plays the Evil Queen (and Regina), Ralph Sbarge does a good job as Jiminy Cricket (and Archie Hopper), Robert Carlyle gives a superior performance as Rumplestiltskin (and Mr. Gold), Ginnifer Goodwin plays a good Snow White (and Mary Margaret), Jennifer Morrison makes a creative Emma Swan, Jamie Dornan does his best as Sheriff Graham and Jared Gilmore puts on a good show as Henry. During each episode there are excellent guest roles that make the story even more enchanting. Once Upon a Time covers two dimensions, one in the fairytale days of old where Snow White and Prince Charming are the center of attraction while the Evil Queen tracks them down. You'll find other characters like Rumplestiltskin, Jiminy Cricket, the Seven Dwarfs and other notables who make their way though one adventure after another. Getting pretty close to the feel of the original Brothers Grimm fairytales, the stories are dark and in some cases very violent. I like this universe the best due to the amazing imagination of the talent that created the characters that roam the kingdom. But, make no mistake, the intertwining of the two dimensions make the show different and enjoyable to watch. In the other half of the universe that's taking place in modern day small town Storybroke, a story plays out that mirrors the simultaneously unfolding drama in the fairytale kingdom. In this world Emma Swan, daughter of Snow White and Prince Charming, has been brought to this dimension to escape immanent danger taking place in the past. Here she's an adult trying to make her way through life following a hard time caused by mistakes including having to give up her son Henry. The show plays out extremely well with some very good twists, deliciously decadent characters and enough action to break up the darkness of the sinister plots. Along the way the writers interject some comic relief and romance yet keeps it PG so most of the family can watch it together. But make no mistake, this series targets women and for them it's a reminiscence of growing up with fairytale dreams while the men will have to take refuse with the dark action and conflicts. Selling your soul to save your son, my favorite episode called Desperate Souls finds Emma Swan running for Sheriff with the spiteful Mayor Regina backing the opposition. The chapter gets really edgy when Mr. Gold offers Emma an opportunity to win in return for a favor. Also in the episode we find Rumplestiltskin trying to save his son from being dragged off to war at the age of 14 with his father making a deal that turns sour. The series has some references to another of ABC's hits, Lost. It really doesn't come as a surprise since the writers of Once Upon A Time are Adam Horowitz and Eddy Kitsis who penned Lost. Along with those plot insertions you'll see several of Walt Disney's animated film references mingled within the 22 chapters. Look for Hansel and Gretel, Jiminy Cricket, Cinderella, Rumplestiltskin, Belle from Beauty and the Beast and more. The series has been released in both DVD and Blu-ray, but this review covers the latter from which I gathered my critical analysis. The Blu-ray box set has 5 discs with the 22 captivating chapters and many bonus features. Of course the real reason to get the box set is for the story, but having the additional features does make it a bonus buy. 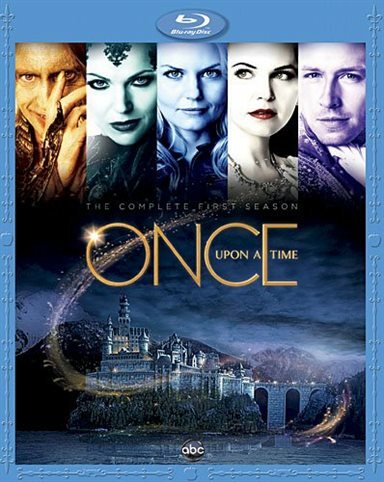 With season two of Once Upon A Time coming to ABC on September 30th you will want to get the Blu-ray quickly, especially if you have not seen the program when it aired in October 2011 through May of this year. "ONCE UPON A TIME: ORIGINS" – Viewers enter into this interactive archive and uncover the rich and diverse historical origins of the world's favorite fairy tale characters from "Once Upon A Time." Josh Dallas guides fans to discover how each of these European based tales has evolved over centuries of retellings into the stories known and loved today. Watch this after you have played the series. It's a very good feature and one you will probably replay again. "FAIRY TALES IN THE MODERN WORLD" – This feature allows viewers to explore the genesis story of "Once Upon A Time," as they learn about the creative approach of adapting a world of fairy tales into the wholly original world of the show. It's definitely worth the watch. "BUILDING CHARACTER" – From start-to-finish, following the creation, conceptualization, casting, clothing and filming of the beloved character, Belle, played by Emilie de Ravin, from the ground up. I liked this feature very much and it's worth watching after you have seen the series. "WELCOME TO STORYBROOKE" – Ginnifer Goodwin takes audiences on a tour of Storybrooke, Maine, both the town on the show and its real inspiration – a small town outside Vancouver. "THE STORY I REMEMBER… SNOW WHITE" – The show's actors share their childhood memories of the beloved fairy tale Snow White, illustrated to original storybook graphics. "THE FAIREST BLOOPERS OF THEM ALL" – The outtakes are pretty good, but nothing to write home about. DELETED SCENES – Nine Deleted Scenes most of which would not have made a difference are shown in this feature. AUDIO COMMENTARIES – The commentaries by Co-Creator /Executive Producers Edward Kitsis and Adam Horowitz; writer Jane Epenson; and cast members including Ginnifer Goodwin, Josh Dallas, Robert Carlyle, Lana Parilla and Jennifer Morrison are worth while during most of the episodes if you want to replay them. "Once Upon A Time: The Complete First Season" DVD bonus materials include all features except "Once Upon A Time: Origins". The Blu-ray disc provides a bright clear picture on my 16X9 widescreen HD Television and brings out the fine cinematography of the production company. The close-ups are excellent and the dark dank forests look real. The 5.1 DTS Master Audio plays well on my television's sound system coming out crystal clear. Special sound effects enhance the story and my surround speakers bring out the music from front to back and sides yet don't interfere with the dialogue. Download Once Upon a Time: The Complete First Season from the iTunes Store in Digial HD. For more information about Once Upon A Time visit the FlickDirect Movie Database.